You can both diversify for safety and boost your returns by adding international investments to your portfolio. In the past year, international stocks performed 2.5% better than U.S. stocks. And developed countries with the most economic freedom returned an additional 4.4% more than the international index. None of these returns, however, were positive. During the one-year period ending June 30, 2008, the S&P 500 index lost 13.12%. The MSCI EAFE Index of international developed markets lost 10.6% (in U.S. dollars). Significantly, 10 of the most economically free countries only lost 6.2%. These premiums for investing overseas in countries with the most freedom are even more impressive for longer time periods. Over the past five years, the S&P 500 has averaged 7.6% and the EAFE Index 16.7%. In striking contrast, the countries with the most economic freedom averaged 21.5%. Put some money into the “emerging markets” category, and you can gain even greater diversification and returns. Emerging markets, as measured by the MSCI Emerging Markets Index, actually gained, appreciating 4.6% (in U.S. dollars) in the past year. They have averaged a whopping 29.8% over the past five years. Of course, there is a caveat: emerging markets are inherently more volatile than the markets of more developed nations. If you have a very small account, investing in one good international fund is sufficient. For slightly larger amounts, a savvy asset allocation might be to invest two thirds in the MSCI EAFE Index and one third in the MSCI Emerging Markets Index. Using this technique, you would have only lost 5.5% in the past year and averaged 21.0% over the past five years. For larger accounts, use a more complex asset allocation for further diversification. Take advantage of the fact that economic growth often flourishes in countries with the greatest economic freedom. We use the Heritage Foundation’s measurement to select those places that combine the greatest economic freedom with large investable markets. Since 1994, the Heritage Foundation Index of Economic Freedom has used a systematic empirical measurement of economic freedom in countries worldwide. Their conclusions clearly show that economic freedom and higher rates of long-term economic growth go together. Investors can use the study to select countries for their foreign stock allocation. The Foundation bases a country’s economic freedom score on 50 measurements. They fall under these 10 categories: trade policy, fiscal burden of government, government intervention in the economy, monetary policy, capital flows and foreign investment, banking and finance, wages and prices, property rights, regulation, and informal market activity. Although all 10 boost economic growth, some, such as investment freedom, are more significant to outside investors. Others, such as monetary freedom, are more critical to that country’s own citizens. Only 17 countries out of 157 scored high in investment freedom, which measures the ability of capital to flow freely in and out of the country. Free countries impose few or no restrictions on foreign investment. Thus, they represent the greatest opportunities for investment. More than a third of the world imposes serious restrictions on the ability to run businesses, purchase real estate, or transfer capital. These countries are best avoided. A number of the countries ranked high in economic freedom have exchange-traded funds (ETFs), such as Hong Kong, Singapore, Australia, Canada, Switzerland, the United Kingdom, the Netherlands, Germany, Sweden, and Austria. These funds track each country’s market index and offer a convenient and inexpensive way to invest there. ETFs combine the liquidity of individual stocks with the diversification of an index fund. They also typically carry lower expense ratios than most mutual funds. For larger accounts, we recommend you invest half of your assets using the simple technique just described. A third is invested in the MSCI EAFE Index fund and a sixth in the MSCI Emerging Markets Index fund. 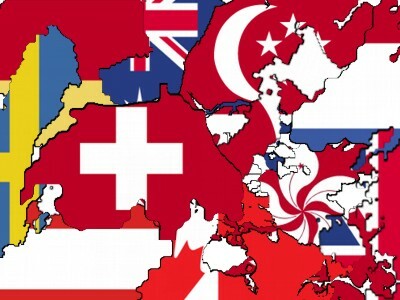 The other half is divided among the 10 countries with the most freedom whose markets also accommodate a country-specific ETF. Canada had the best returns over the past year, mostly because of its emphasis on energy stocks, earning 13.9%. In the same time period, 8 of the 10 countries cited earlier beat the broad MSCI EAFE Index. Only two, the United Kingdom and Sweden, fell short. Japan, with the world’s second largest economy, has demonstrated more financial freedom in recent years. But government spending is greater than a third of its gross domestic product and a large number of legal restrictions on capital make investing in Japan quite problematic. It is ranked below-average in government size and financial freedom and lower than we would recommend in the important investment freedom category. These restrictions push the country down to the 17th most free economy. We can attribute Japan’s malaise after its own stock market bubble to its lack of economic freedom and the government’s overly aggressive interventions. Former prime minister Junichiro Koizumi’s changes made the country a more attractive place to do business. It remains to be seen if these changes are significant enough. Diversifying your foreign investments is just one critical element of an optimal asset allocation. Building balanced portfolios that are more likely to meet your financial goals doesn’t happen by accident or by working with someone whose interests are in conflict with yours. Visit the website of the National Association of Personal Financial Advisors at www.napfa.org or call 1-800-366-2732 to find a fee-only advisor in your area.